Standard's Modular Series Credit Card changers allow credit card acceptance and ticket dispense. Available in your choice of dial-up or hi-speed communication with the Datacap Systems Tran products and several different certified card processors. The MC350RL -CC has a 4-button Package Select kit that allows owners to set-up the package price and number of tokens they want to dispense, and an LCD display that provides prompts and feedback to the user. The MC350RL-CC is a machine that is ideal for use in admissions or proof-of-purchase tickets for carnival rides, bounce houses, and festivals. 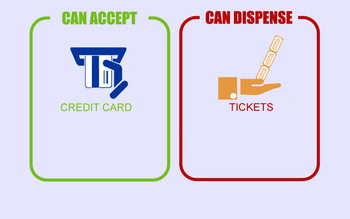 Zoos have used our credit card-to-tickets change machines to sell tickets for train rides and elephant or camel rides. Many carnivals and festivals have used these machines to dispensed tickets for rides, games, food or beverages.